Earl Zimmer has played a key role in the HUBER Transmission since 1989, as being the sole manufacturer of our hubs and pistons. Earl has owned and operated ZIMMER GEARS, a successful automotive gear company for 35 years and also operates a manufacturing & fabricating business. 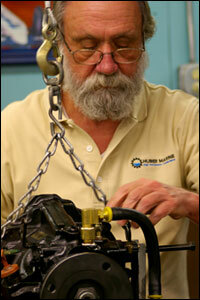 His background in mechanics has made him a master craftsman in specialty parts and repair. Earl takes pride in what he does. No assembly line job, but hands-on personal attention to each transmission for optimal results. He takes great care in maintaining his signature craftsmanship. HUBER MARINE’S business is transmissions only, and we will continue to research new technology to bring you the best in high performance marine transmissions.